I’m a big fan of the reality show So You Think You Can Dance. It’s probably one of my favorite shows because these young folks have committed their lives to their artistic process. These artists have devoted countless hours to their art. They have devoted their lives to expressing their narratives through their bodies. One young man who had auditioned last year returned for another try. He got on stage and told the judges that his father had died last December. The judges knew his father because at the last audition he got up on stage and danced with his son. It was a shock for everyone, judges as well as me, a viewer. He moved to the choreography round. Unfortunately he didn’t make it to Hollywood. His story was touching, and filled with meaning. The amazing thing about this young man was his perseverance. He was eliminated and instead of walking away from the competition, he went to the next city where auditions were being held to audition again. His audition piece was the story about the last message his dad left him before his death. It was moving, heartfelt, and beautiful. Once again he moved on to choreography where this time he was invited to move to the Hollywood round. He told the judges before he danced, I’m a dancer, and dancers don’t give up! He took an incredibly painful experience and expressed it through dance. He used his body to emote. He was impacted so deeply by his experience that the only way he felt he could honor his father and his craft was through his choreography. His determination was glorious. He shows us how art provides a platform for ultimate self-expression and that leads to healing. As an artist he personifies the healing experience. I’m not a dance, but experiencing his dance provided me encouragement to continue creating art in my own medium. He punctuated the importance of telling one’s story, mining his soul for the impact of his life experiences. This young man may not win the competition, but in my eyes, healing is winning! I just read a news article that Maya Angelou died. I’m sitting here trying to think about what to write, but there are so many things to say that I could probably go on for days. Her work, her talent, and her honesty were incredibly brave. She was a trailblazer. Her stories and poetry shared her deepest personal experiences showing us the healing powers of releasing the negative in our lives. She was an inspiration to women! Oprah Winfrey was a dear friend of Angelou and together they served as beacons of hope for African American women. She showed us all that our hardest challenges could be overcome and that we can create a life full of meaning and purpose. My favorite poem of Angelou’s is Continue. It was the poem Angelou wrote for Oprah’s fiftieth birthday. It talks about the gifts we are born with and how over time we allow those gifts to flourish. Angelou talks about the importance of “continuing” because we all have life missions we need to complete. I have the poem Continue on my phone read by Angelou. I listen to it when I need some support to continue the work I’ve been put on this earth to do. I listen to the poem when it feels like it would be easier to abandon a mission instead of forging forward because our soul signature is undeniable. On the lighter side, I also have the cookbook Angelou wrote a few years ago. Her banana pudding is delish! She shared her world view and personal stories on a food journey. It shows us that food can be as much an art form as poetry. Our stories can be manifested in many different ways. I hope you’ll go out and read something Angelou wrote. Find inspiration in her words, her food, her life! I’m a textile artist. I started my textile life as a traditional quilter and found art quilting about 10 years ago. When I was introduced to art quilts I had found my oasis in the artist desert. 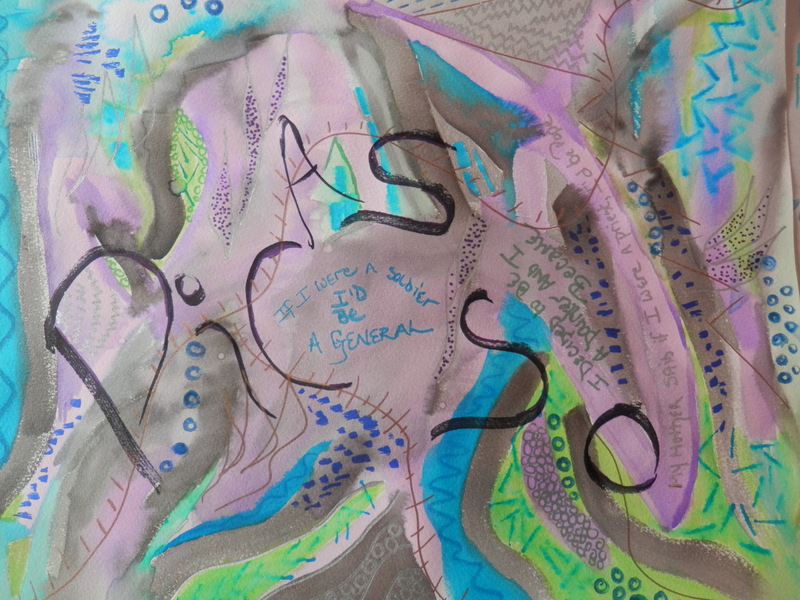 I was looking for a way to express myself and using patterns in books wasn’t making the impact I wanted to make. I was told about an art quilt guild and found my home, both artistically and in my heart. As I continue my personal art and healing journey I’m always drawn to new ways of ultimate self-expression. I’m an avid reader so books are always around. I’ve seen posts about book art, but wasn’t really sure what that entailed or how I would incorporate this art form into my art and healing regimen. Being unfamiliar with book art I had to find a source that would provide guidance, support, and education. My Google search gave me a link to the Book Arts League. I was fortunate that a beginner’s class was just four days away, so I signed up. I like to take classes because I want to understand the process. I’m not looking at how to make incredible works or art until I grasp the steps. I’m all about the process and the instructor was very process driven….love that! Why try and learn another art form? I find that the more ways we have to express ourselves, the more complete our narrative becomes. By creating in different art forms we may tap into areas of our subconscious that can only be accessed through a new pathway. Giving yourself the gift of new mediums makes you think different, acts as a catalyst for creativity, and provides a new opportunity for fun. 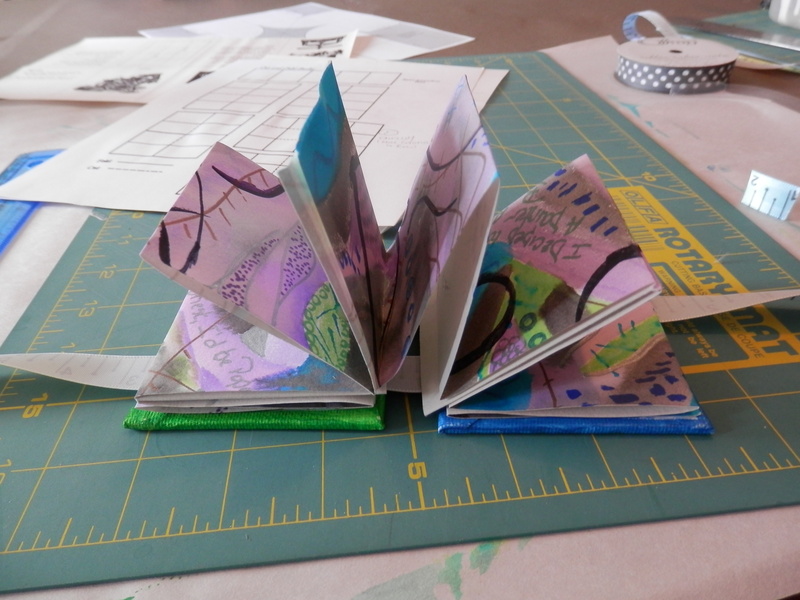 For me, the book arts allow me to create things in multiple sizes. It gives me the opportunity to create something small that I can carry with me wherever I go. I can create a work of art that serves as reminder to be present, to think creatively, and to commune with spirit. Working in another medium gives me new avenues to pursue in my textile art and that’s crucial to my never ending love of textiles. What new things are you going to learn on your art and healing journey? How will this translate to our narrative? How will it serve you as you move through the challenges life presents? They say that practice makes perfect. I don’t know about perfect, but practice certainly makes us better. There’s an old adage that asks, “How do you get to Carnegie Hall? The answer is practice, practice, and practice. It’s said we require doing something for 10,000 hours to achieve mastery. Ten thousand hours makes you quite regular. I find that my creativity flows the more time I spend in my studio. Fortunately, I have more than one avenue for creative expression so my pump is continually primed. One of the ways to stay regular is to continue to learn. I spend lots of time browsing the library shelves looking for books that may prompt me to do something new. The more opportunities I give myself to create means I continue my healing journey through ultimate self-expression. I can tell a story, my story, any story in different ways. I give myself the gift of telling a story in many different art forms: art quilting, knitting, and writing. 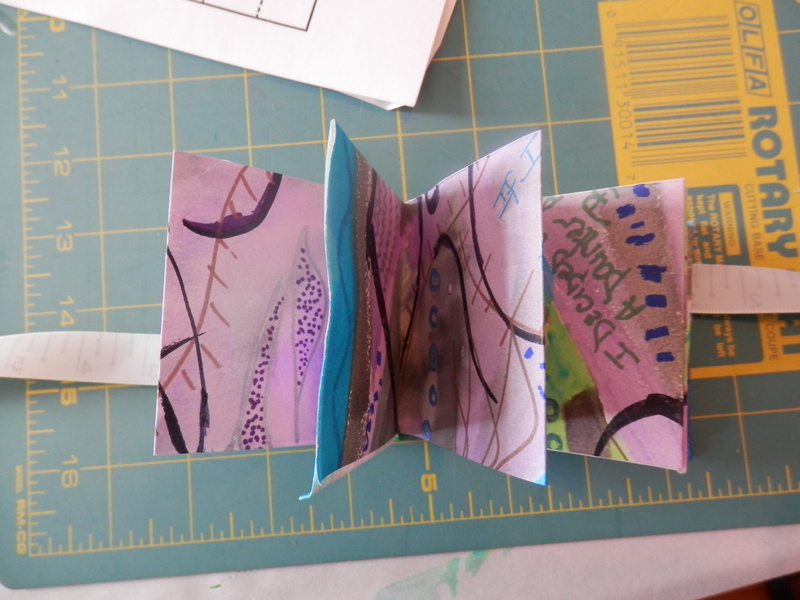 When I was writing my dissertation on Art and Healing, I came across an artist, Martha Hall, a book artist that utilized interesting materials to tell her story. She used her appointment cards to create a book to tell her illness story. It was unique and innovative. It was poignant. It allowed her to turn her mess into her message. It was creative, informative, and expressive. How will you create regularity in your artistic and healing ventures? What inspires you to engage in ultimate self-expression? Is Your Art Filling In the Gaps? Why do you create? At first you’ll respond with, “I create because I’m an artist.” That would be true for many but not all. However, I’d like you to take it a step further. Why do you create? Is there a story to be told? Did you have an experience that is seeping out of your pores and your art expels it from your body? Is it a celebration you want to share? There is something beyond just the fact that you’re an artist. We spiritual beings having a human experience; we’re all artists. Romare Bearden shared, “An artist is an art lover who finds that in all the art he sees, something is missing; to put there what he feels is missing becomes the center of his life’s work.” The mind is powerful and is in a state of flux when there are gaps in experiences. We want wholeness, completion, and resolution. Our creative energies are expansive and strive to fill in the gaps. In fact, according to Bearden the gaps are our motivation and inspiration. The truth is that we can all spend the rest of our lives filling in the gaps. The great thing about filling in the gaps is what we’re never without a catalyst to create. Art can serve as a means to making the necessary connections between ideas or feelings that are floating out there on their own. In London, when traveling on the tube, stenciled on the ground is “mind the gap”. What if you applied that saying to your own work? Being mindful of the gap brings awareness to your work. It allows you to share your inner healing and wholeness with the world and the Universe. Bearden’s insight was profound. Exploring the gap allows us to develop a plethora or opportunities. We’re looking toward the future. The gap is a roadmap on your journey to bountiful. What will you do with your gap? When we discuss creativity and art we feel immediate pressure to become the next Picasso, Christo, or Neruda. Creating isn’t about perfection; it’s about expression. Creating art or expressing oneself creatively is pure. It is an honest depiction of our souls. Each and every day we are given the opportunity to engage in ultimate self-expression. It doesn’t matter how you do it, just do it! Osho said it best, “When I say be creative, I don’t mean that you should all go and become great painters and poets. I simply mean let your life be a painting, let your life be a poem.” These words of wisdom are freeing. Osho is saying approach your life as art, be the art. This is the beauty of our stories; they’re all works of art. When we become the art we exude beauty. Our authenticity infuses all of our relationships and experiences. You can choose to work on becoming an award-winning artist, or you can be art. You can shine a light on stories that we all need to hear, see, and experience. Being art should be the easiest thing you do, instead of something you have to learn how to do in the studio. This is why art is healing, because self-expression exudes power, vulnerability, and truth. How you frame your life, your art is entirely up to you, but frame it in a way that allows you to shine the brightest. Guild your life! Allow your story to be a beacon in the dark. Create works of art either on canvas, paper, or in your soul that draws us closer to one another. Go create! Bring forth the art that lies within and share it with the world! Creatives ask themselves the question about readiness on a regular basis. Starting their art-making journey is truly a pilgrimage. Those who engage in creative endeavors are called to make art. We may not think about the “why” behind wanting to make art; we’re just summoned by our soul to start creating. Chris Fontana of Global Visionaries shared, “No one is ever ready till they start”. His quote may seem obvious, but it’s not simple to set in motion. So many people hold off creating art because they are waiting for the right inspiration or the perfect class. Perhaps they are waiting to accrue enough money to take a class from a famous teacher, when all it takes is something as simple as a pencil and piece of paper to begin creating. We don’t necessarily need the perfect journal to write the next Great American Novel, perhaps all we need is a paper napkin where we scribbled a flash of inspiration so we won’t forget. I have post-it notes all over the place that I bring together in a notebook. It’s a great way to see how your ideas evolve over time. My notebooks from school are filled with doodles, words, and ideas that I can incorporate into my art. What will get you to start? What if you simply picked up something and began creating. It could be as simple as picking up a stick at the beach and making a design in the sand. Want to keep that masterpiece forever? Take a picture of the sand design with your phone. It can become part of your creative repository. The idea that we can create anywhere and everywhere is encouraging. Engaging in the creative process allows us to release our voices into the stratosphere. Feeling heard is a crucial component in your health and healing pilgrimage!